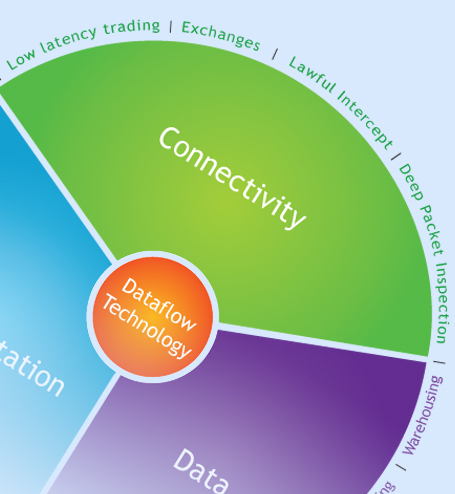 Connectivity applications are highly efficient on dataflow computing systems. Dataflow engines focus on optimizing movement of data in a system, allowing multiple channels of data to pass through processing elements at full line-rate with predictable low latency. The MPC-N series connectivity nodes provide multiple dataflow engines with data connections. Dataflow engines can monitor data traffic for applications such as deep packet inspection or lawful intercept, filtering line-rate traffic for data points of interest and sending identified data packets to CPUs for further analysis. Low latency financial trading applications can utilize our Maximum Performance Trading (MPT) platform to deliver programmable trading applications or Direct Market Access (DMA) gateways with fully in-hardware turnaround times of a few microseconds. Financial exchanges can also exploit the MPT platform for ultra low latency matching engines, market data manager or order routers.